We not only service Roma but also the surrounding districts. Most Tuesdays we visit Miles . 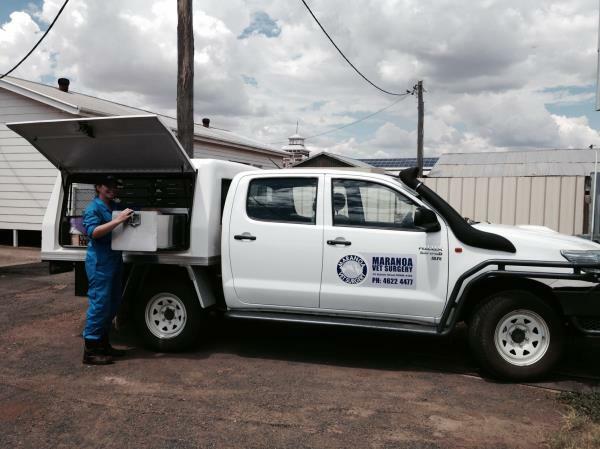 We travel to Miles via the Warrego Highway through Wallumbilla, Yuleba, Dulacca and Drillham. We will travel off the highway to properties and clients are charged mileage from the highway only. We visit Injune on Thursdays. We service small animals from the visitor information centre or your home and large animals on property. Mileage is calculated and charged from Injune, or the the Carnarvon highway on the way to Injune..
We travel to Mitchell on the first wednesday of each month. We are happy to visit more often should more visits be requested. Mileage is calculated from the highway on the way to Mitchell or from Mitchell town. We visit Surat on Fridays when there is suffient work booked in. We travel down the Southern Road, accross Hartwood Lane, Maranoa Rd then south to Surat. We return via the surat- Roma Highway. Mileage is calculated as per other clinics- great way to save money! On our Clinic run days days we can perform general health checks, vaccinations and de-wormings, microchipping, pregnancy testing and bull testing of cattle, equine dentals, geldings, mare scanning and vacciantions and a range of other procedures.